In this updated edition, Pastor Kyle adds a new introduction as well as new content about the battle many of us face with technology-whether we are tempted to send just one more text, stay online when our bodies need rest, or find ourselves putting email before in-person relationships. How can we seek God with our whole hearts instead? 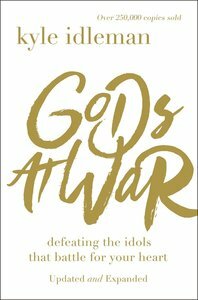 Using true, powerful, and honest testimonies of those who have struggled in each area, Gods at War illustrates a clear path away from the heartache of our 21st century idolatry back to the heart of God-enabling us to truly be completely committed followers of Jesus. Kyle Idleman is the Teaching Pastor at Southeast Christian Church in Louisville, Kentucky, the 5th largest church in America. He is the author and presenter of the Award-winning video curriculum series H2O: A Journey of Faith and The Easter Experience. Kyle and his wife, DesiRae, have four young children. Customer Reviews For "Gods At War"
I have been struggling in my understanding of why Bible tells us to guard our hearts, for from it flows the wellsprings of life. This book has illuminated the various gods that take preeminence in our lives, and exalt themselves as more important than Jesus. I found myself in the pages of this book and it was truly liberating! Unless the gods of our lives are brought to our attention, we would continually be led by them instead of God. Must read! !